4Media Movie Editor is a professional movie editor that enables you to create home movies on your computer, complete with multiple transitions, artistic effects, music and even subtitle. 4Media Movie Editor supports various video formats including camcorder videos (MTS, M2TS), HD/SD videos (MKV, WMV HD, VOB HD, QuickTime HD, AVI, 3GP, M4V, MPEG, MP4, RM, RMVB, FLV, VOB, MPV, MOV, DAT, ASF, WMV). 6.Freely add music or audio track to a single clip or the whole project. Qweas is providing links to 4Media Movie Editor 6.5.2.0907 as a courtesy, and makes no representations regarding 4Media Movie Editor or any other applications or any information related thereto. Any questions, complaints or claims regarding this application 4Media Movie Editor 6.5.2.0907 must be directed to the appropriate software vendor. 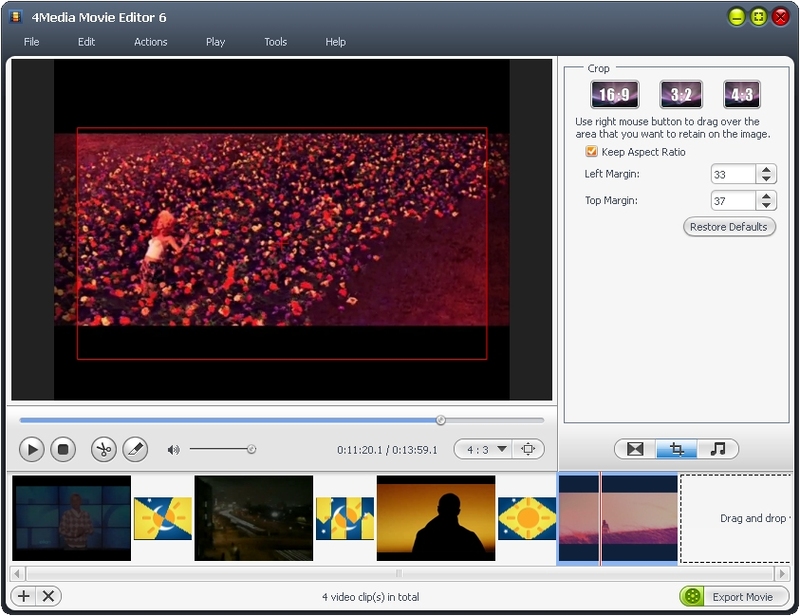 You may click the publisher link of 4Media Movie Editor on the top of this page to get more details about the vendor.